There are mixed views on whether the price of houses will go up, come down or remain the same when the Goods and Services Tax (GST) kicks in on April 1. Customs Department director of GST Datuk Subromaniam Tholasy “presumes house prices may even fall” while Real Estate and Housing Developers Association (Rehda) chairman Datuk Ng Seing Liong believes it will rise. And IFCA MSC Bhd’s chief financial officer Daniel Chow thinks the GST will be a “non-event” in terms of selling price increase. Subromaniam said the price of steel was “significantly down” and the price of other raw material were coming down slowly in tandem with falling oil prices. “If we consider other market conditions, I presume house prices may even fall after taking into account the GST. “Property developers should pass on cost savings to house buyers,” he said in an interview. He said land was the “biggest cost component” and there was no GST imposed on residential land. Residential houses and land are exempt from the GST but construction material such as steel, cement, sand, tiles, etc, are not and would be subject to the 6% GST. Currently, these construction materials fall under a “First Schedule Goods” and do not incur any Sales and Services Tax (SST). The GST replaces the SST in April. Subromaniam agreed that under the GST, the base would be broader with more input such as construction materials being taxed. Whether this would lead to higher costs, he said, the fact was that many items were already being taxed under the SST, which was a less efficient regime and could actually result in bigger tax costs. “We have facts to show that the hidden SST is much more than the actual rate,” he added. Subromaniam said their estimate was that with the GST, the actual increase – if all factors remain the same – would be between 0.5% and 2% maximum. “It is so minimal if any. Developers should absorb it because their (profit) margin is typically between 20% and 30%,” he said. Ng, however, said developers would not absorb the extra cost and would pass this on to buyers. 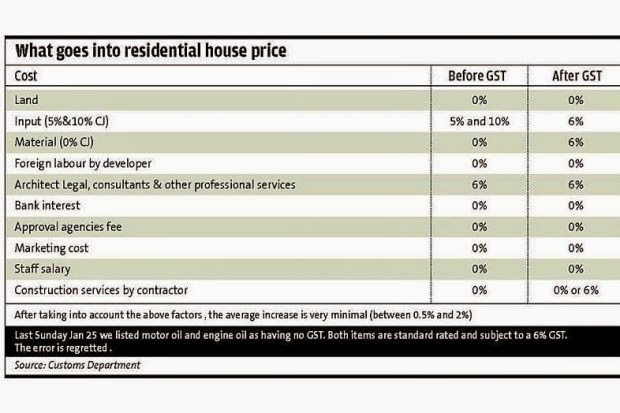 He said based on Rehda’s calculations, the GST would result in a 2.6% increase in house prices. Calling for major components such as cement, concrete, bricks and sand to be zero rated, he estimated that they made up 44% of the cost of construction. “If these can be zero-rated, the impact will not be as great,” he said. He also urged the Government to zero-rate residential houses instead of exempt rate. IFCA-MSC’s Chow did not foresee any increase in the selling price from April to December because he believed there would be an oversupply of residential properties by the end of the year. He said many had bought pro­perties two to three years ago paying only the minimum 5% as downpayment under the Deve­­loper-Interest-Bearing-Scheme (which was no longer in effect) with the intention of selling on completion. “Most are opportunists and property flippers who bought a few units and have no holding power to pay the instalment once the property is completed. 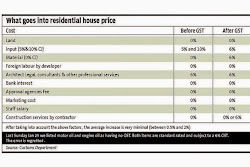 Chow estimated the GST tax implication to be 2.1% to 2.2% of the cost of housing which he described as “very minimal”.